The history and much of the present ambience of Utah's capital are the result of the arrival in the Great Salt Lake Valley -- in July 1847 -- of 148 Mormon pioneers who had escaped religious oppression in the eastern states and were looking for an area to settle in peace. Within a year, many more Mormons made the arduous trek over the Rocky Mountains to the valley and Great Salt Lake City was a reality (the "Great" was dropped in 1868). The transcontinental railroad arrived in the valley in 1869 and Utah became the 45th state in 1896. 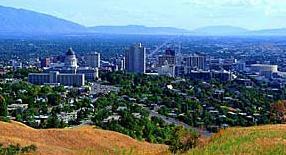 By then, the Mormons had ended their practice of polygamy, and with statehood, the modern city took shape.